Today’s big Apple event was all about the iPhone, iOS 6, a major refresh to the iPod lineup and more – but it also featured some big, crazy iPad numbers. 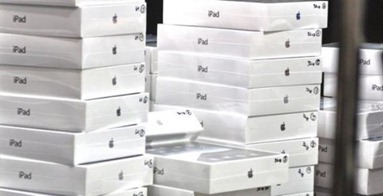 — 17 million iPads sold last quarter – a new record. We already knew about this one but it’s still very impressive. — “We sold more iPads than any PC manufacturer sold in their entire PC line.” And Tim Cook pointed out how incredible this is when you consider that this category didn’t exist just a few years ago. — Last year the iPad had a 62% global market share – now it’s at 68%. 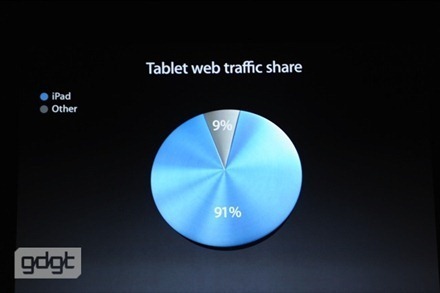 — As you can see in the slideshow shot above, iPad accounts for a ridiculous 91% of all tablet web traffic. 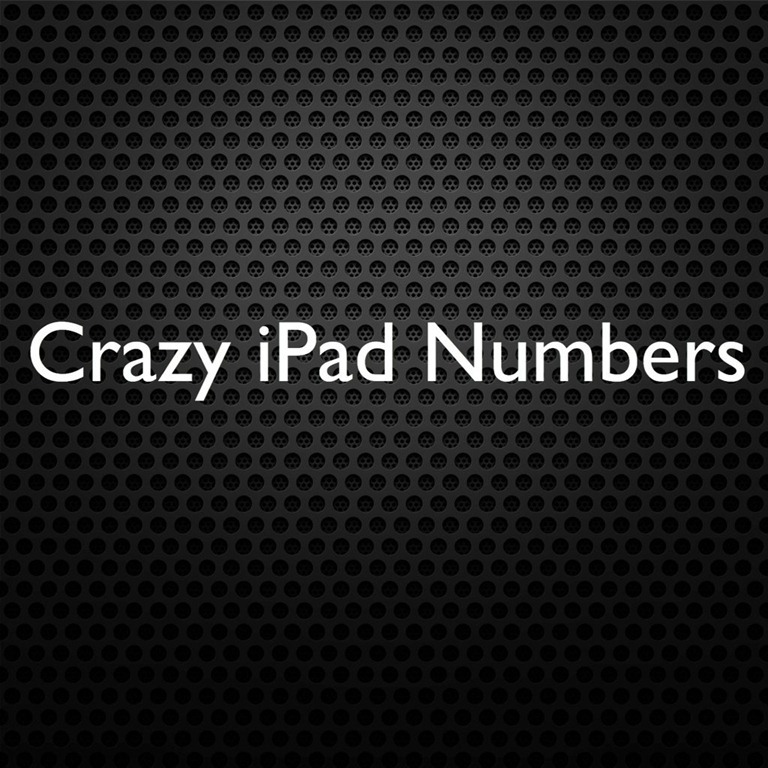 And all these numbers should only be boosted again with the expected release of the iPad Mini next month. 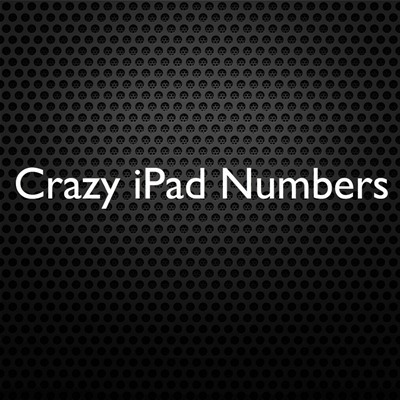 There were a lot of crazy, impressive iPad numbers revealed in this week’s Apple Q2 financial results call – including 67 million iPads sold in two years. A recent report at Apple Insider highlights a few more impressive numbers mentioned by Apple, specifically relating to the education sector. Apple’s chief financial officer Peter Oppenheimer noted in the company’s Q2 conference call that US K-12 education customers had purchased twice as many iPads as Macs, despite also setting a new record in Mac sales for the quarter. I would bet this will be the start of a continuing trend – not just because of Post-PC era type momentum for tablets in general, but also because the iPad is just so well-suited for the education sector. The form factor and design of the device, the great range of education apps for K12 right through university students, iTunes U and iBooks Author and iBooks textbooks are all things that make it such a great fit. Apple reported its financial results for its 2012 second quarter yesterday afternoon. Once again their results were stellar overall – and helped by some big iPad numbers. 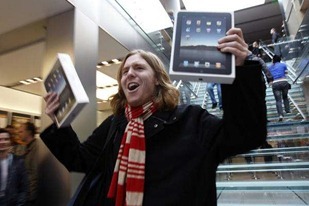 They sold 11.8 million iPads during the quarter – a 151% increase over the same quarter last year. The innovation part could be referring to just about anything from Apple, but I think it’s notable that it is mentioned in the same sentence as the new iPad, in particular. Maybe, just maybe, a hint at an expansion of the iPad line? According to recent reports highlighted at Apple Insider today, Foxconn is said to be shipping 20 million iPad 2 units to Apple this quarter. That’s a massive number just on its own. Add in the fact that last quarter was a record breaking one for iPad sales at less than half that number (9.25 million) and it is put in better context. Then think about the fact that those 20 million are for the quarter ending in September – so that’s before the big holiday quarter. If these reports are even close to accurate then the number of iPads sold this year is going to be one heck of a huge number. It would put 50 million within reach I think. As 9to5Mac reports, recent studies from the Net Applications research firm show that the share of global web browsing done from mobile and tablet devices is rising sharply, nearly doubling in the last 10 months from 2.60% last August to 5.02% in June of this year. The iPad – incredibly – accounts for 1% out of that 5% total for mobile and tablet devices. So 20% of all mobile and tablet browsing is done on an iPad. Incredible, with the huge number of smartphones and mobile devices in use. I’m happy to say I continue to see evidence of this trend on this site. 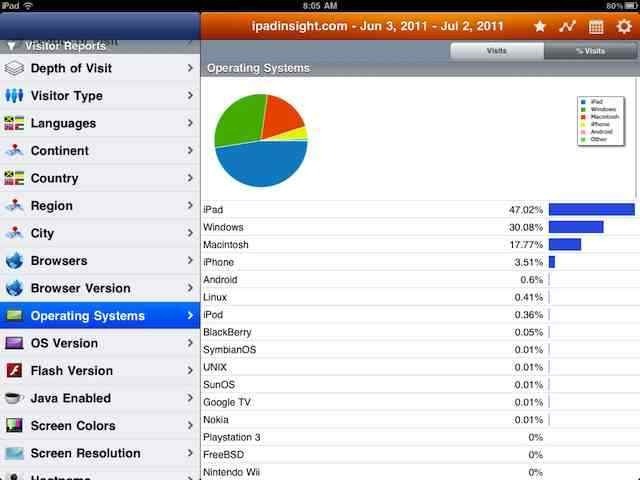 Stats for last month show that over 47% of visits came from iPads. Great stuff. How much of your web browsing do you do on your iPad? What’s your percentage? A recent report at Apple Insider highlights some lofty analyst predictions for iPad sales this year. 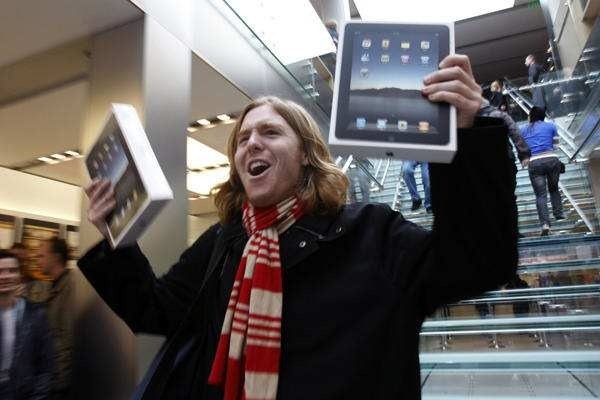 Sales of the iPad in 2011 could exceed some of the highest expectations, as overseas component makers have indicated that Apple could sell 45 million of its touchscreen tablet this year. Analyst Brian White with Ticonderoga Securities is on day 6 of his tech trip to China and Taiwan. In his meetings with component suppliers, sources have revealed expectations that Apple will sell between 40 million and 45 million iPads in 2011. White said he heard those same figures in a separate visit to Asia last fall, but "at the time, this number was difficult for many investors and some in the media to get their heads around." Other analysts cited in the article predict iPad sales of close to or at 30 million for 2011. All of these numbers would be impressive, given that Apple sold 15 million iPads in its first year, and there is now finally some (increasing) competition for the iPad. It’s going to be fascinating to hear what kind of initial sales numbers Apple announces for the iPad 2 in their upcoming earnings call middle of this coming week. Looks like the iPad had a pretty damn good holiday weekend. 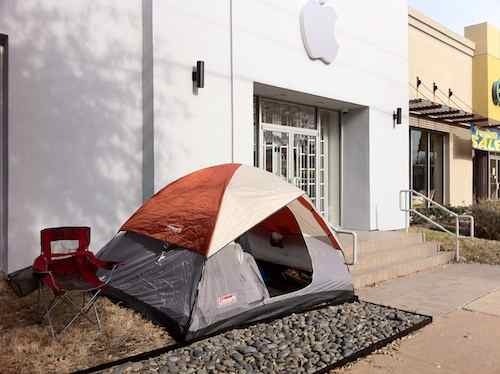 A report from Piper Jaffray analyst Gene Munster’s team says it was selling at a rate of 8.8 units sold per Apple Store per hour. That’s fast – I’ve been in a busy Apple Store here in Austin (a lot) and bought iPads and seen them bought, and it’s not the quickest process in the world. It’s also a pace that put it ahead of Macs in Munster’s report. 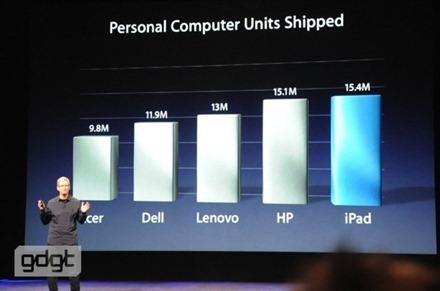 That’s pretty damn impressive too, especially given how popular the new MacBook Air is. I imagine the iPad will have a huge holiday sales period overall – the only thing I can see holding it back some at this point is that some people will now be waiting on next year’s iPad 2. That’s the headline from a report at Apple Insider earlier today – covering one analyst’s prediction that Apple will sell 28 million iPads in 2011. That feels like an enormous number, though I imagine it will be easier to put it in context once we see what number of iPads are sold in 2010. I’m guessing around 10 million.